6th Jan 2017 - What's new! What does The English Apple Man have in mind for 2017? WELL: A landmark Birthday at the end of March as I reach my mid seventies....oh how fast the time goes! In late February The 50th Anniversary of The Under 40's Conference takes place in South Africa.....The English Apple Man WILL be there with the 'future' of our UK top fruit industry, represented by the group of young growers, scientists, agronomists and (very important) representatives of the 2017 Under 40's Conference SPONSORS; without their support this fantastic opportunity to experience fruit growing in the Southern Hemisphere during the harvest period would not be feasible. This is the first time The U40 Conference has ventured 'South of the Equator'..........visit the The 2017 Under 40's Conference website for more information. 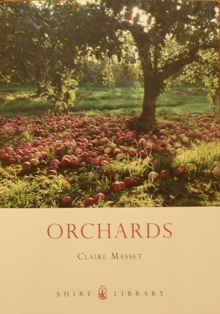 This is an easy read, focused on 'old orchards' with history dating back to Roman times right up to the present day. It is not a book about modern commercial orchards, but an excellent indication that the Romans may have established the first orchards as pruning books have been found at known Roman sites at Darenth and Hartlip in Kent. This early commitment however, came to an end with the end of Roman occupation in AD 410 which opened the 'floodgates' for attacks by Jutes, Saxons and Danes; Claire Masset points out most of these Battles took place in Kent, obliterating the orchards there. The arrival of St. Augustine in AD 597 led to new orchards being planted; when he built his Monastery in Kent he established a model based on self-sufficiency and working the land, which was copied by Monasteries across the country and Monks became experts on growing herbs, vegetables and orchards.